I have been teasing you with this post for so Long that I am almost sad I haven’t posted it yet. This was so amazing, I could seriously write about it forever. But I won’t. I will give you important information, and the rest you will see in my photos. So our two-day trip to Slovenia started with us staying in a very modern and nice Hotel Sotelia, where we had a nice Spa day as you have probably seen in my previous posts. On the second day, after we had some fun in the great outdoors, we were taken to the Terme Olimia glamping site. I have had no previous experience of glamping, but it is very popular in Slovenia so I was really excited. The camp is surrounded by a high wooden fence, and you can only enter with the key. There are two different types of glamping accommodation. A small one for 2 people, or a bigger one for 4 people. We got the bigger one for the reference. Each of them has a small patio and there is even a jacuzzi in front. Yes, that is a Jacuzzi, and yes you can go in it. We didn’t because it was quite cold that day, but I have to say. I was very tempted. What I loved the most about it is this lovely tranquil feeling it had to it. It was so nice to just sit and do nothing. Absolutely nothing. It was quite in nature and it was just nice to listen to the birds and enjoy a glass of thermal water. When the night falls, the lovely staff serves you really nice dinner, if you are not in the mood to cook, but if you prefer to be your own MasterChef, you have a kitchen inside the tent, where you can prepare your delicious meals. 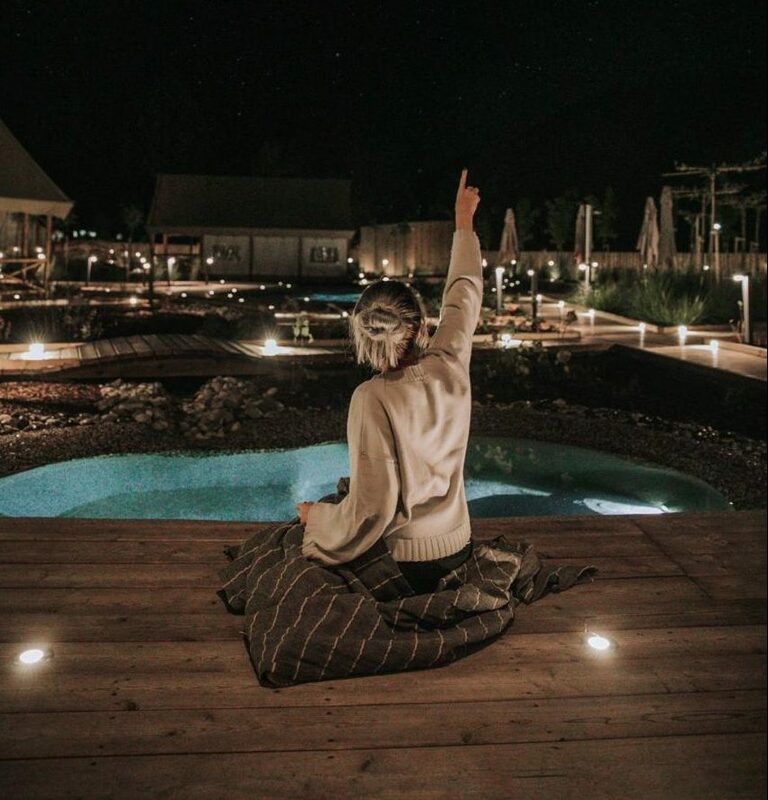 Enjoying the lights shimmering in this fresh Slovenian night, was an experience of its own. One not to be taken for granted as we were mesmerised by everything surrounding us. We slept like little babies, just cuddled up in nice warm fluffy duvets, and when the morning came, our breakfast was served. It was such a lovely surprise and a very nice setup. We enjoyed our short glamping adventure, and to be honest I was so sad to leave. It is a bit more expensive than staying in the Hotel, but it is something you have to put on your bucket list. Heading off to Zagreb, we stopped by a small town just over the border in Croatia, called Kumrovec. The whole town is a little museum. It is very cute, and you should give it some time if you are ever coming this way. Nature was just delightful and the houses were so authentic that it was just a great way to finish off this great trip. We had one more stop before reaching our final destination, and that was Terme Tuhelj, where we had the most epic Steak ever.